The proposal for a National Government will be moved for vote in Parliament today despite the objections of Opposition parties, the Party Leaders were informed yesterday. The attendance of all Government MPs has been made mandatory today. 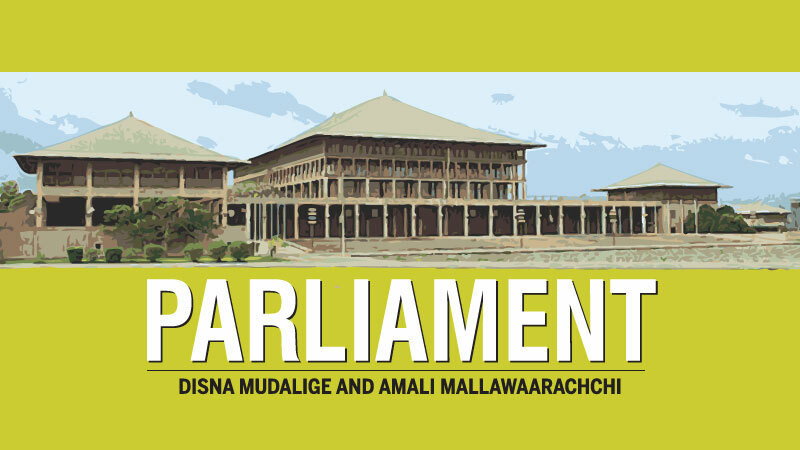 Chief Government Whip and Minister Gayantha Karunathilake had in writing informed all the Government MPs to be present in Parliament all the day and vote in favour of the National Government. A special meeting of the Parliamentary Business Committee was chaired by Speaker Karu Jayasuriya at the Parliament complex to discuss the Determination under the Constitution pending in the Order Paper. Sources said the UPFA, JVP, EPDP and TNA members who took part in the meeting expressed their opposition to the proposal. The Opposition members had pointed out that the said proposal has to be in the Order Paper for at least two weeks prior to being moved in the House. However, the Government had told the Party Leaders that it intends to take it up by suspending the Standing Orders. The Government members had pointed out that it is the practice of the House to give priority to the government business. A vote on the proposal is scheduled to be held in the afternoon following a full-day debate. The proposal seeks the approval to increase the number of Cabinet Ministers from 30 to 48 and the number of Deputy Ministers from 40 to 45. President Maithripala Sirisena in his National Independence Day speech objected to establishing a National Government with a party which has only one seat in Parliament. An argument ensued between Prime Minister Ranil Wickremesinghe and UPFA MP Vasudeva Nanayakkara in Parliament yesterday over providing logistics support to the US Navy ships operating in the Indian Ocean. The UPFA MP questioned on an agreement signed between Sri Lanka and the US Embassy in 2018, but the PM divulged that the agreement MP Nanayakkara referred to was actually signed in 1995. MP Nanayakkara, referring to a newspaper report on the US Navy aircraft carrier USS John C Stennis establishing a logistics hub in Sri Lanka, questioned whether it has got Cabinet approval and as to why Parliament was not informed about it. “The hub established on a temporary basis provides logistics support to the US navy ships operating in the Indian Ocean. The primary purpose of the operation is to provide mission critical supplies and services to US navy ships transiting through and operating in the Indian Ocean. Does this agreement comply with the Constitution’s provisions on sovereignty and non-aligned foreign policy? Doesn’t it pose a security threat for Sri Lanka?,” asked MP Nanayakkara. The PM replied that not only the US Navy, but any other country’s Navy too can get logistic supplies from any port or airport of the country. “The US Navy’s main supplies centre in the Indian Ocean is in Diego Garcia. Other countries temporarily provide those facilities when necessary. The US needs not have large bases because of the modern technology in the world today. The US Gerald Ford aircraft carrier carries more aircrafts than all what Sri Lanka Air force has. It did not come here permanently. We do not permit to bring weapons,” Wickremesinghe remarked. The PM explained that the Foreign Ministry has received a letter on August 28, 2018 seeking renewal of the 1995 agreement and that it also referred to the facilities given under the Vienna Convention. “Those facilities had been provided before. However, we have not yet taken a final decision,” said the Premier. MP Nanayakkara went on to claim that a new agreement was signed in 2018 and as per it the US is exempted from emigration and immigration, Defence or Customs laws within the country when bringing in various goods to Katunayake Airport. “Who gave this authority?” he asked. “From where did you learn that? With reference to what document you made that claim?” the PM questioned back. “I got it from the Foreign Ministry,” MP Nanayakkara replied. “It was during your government’s time that the Acquisition and Cross Servicing Agreement was signed. All this started as a result of that. Do you know what that agreement is?” the PM said. “I asked about the 2018 agreement. I found it and it is with me now. It has the Foreign Ministry’s letterhead. I will pass it to you,” MP Nanayakkara retorted also adding that the agreement further allows the US military officers to roam freely in the county without subjecting to local laws. “Tell us what the agreement you were referring to. Expose it,” replied the PM. The PM got the document from MP Nanayakkara and divulged that the date mentioned in that document was May 16, 1995. The PM read aloud the content in the document to dispel any doubts. Justice and Prison Reforms Minister Thalata Atukorale yesterday denied UPFA Kurunegala District MP Dayasiri Jayasekera’s allegation that she misled the House last Tuesday when she stated that the process of hanging of those sentenced to death for drug offences is now with the Presidential Secretariat. Raising a Point of Order, MP Dayasiri Jayasekera said that Minister Atukorale on Tuesday stated to the House that the Attorney General’s Department had cleared the names of five death row inmates who had been found guilty for drug related offences and those reports had been sent to the Presidential Secretariat but it had not responded as yet. Minister Atukorale in response said that there are 48 persons on death row for drug related offences. According to Minister Atukorale, there are four foreign Muslim nationals, four Sinhala males, one Sinhala female, six Tamils and two Muslims are among those who could be hanged. Minister Atukorale said that she is a kind of person who say what she does and does what she says. “We have got nothing to hide or have no intention of misleading anyone,” the Minister further said. The government has plans to include a proposal in the forthcoming budget to recruit 20,000 graduates to the public sector, State Minister Niroshan Perera yesterday said. “Not only internal degree holders but also external degree holders would be given jobs,” he added. “Prime Minister Wickremesinghe submitted a Cabinet Paper last year to provide jobs to graduates and it was passed by the Cabinet. Those jobs were given in several phases. When the first phase of the programme to provide jobs to 15,000 graduates was in progress, a political coup had been hatched. A government of usurpers came to power for 52 days under Rajapaksa’s premiership. Nothing had been done to solve the problem of unemployed graduates by that the unconstitutional government,” State Minister Perera also added. In responsive to a statement made by Opposition Leader Mahinda Rajapaksa, State Minister Perera said that “The Opposition Leader stated that only internal degree holders are given jobs. It was President Maithripala Sirisena who proposed that internal degree holders be given jobs during the first phases. Our Cabinet Paper was to give jobs to all unemployed graduates, and we would do that,” the Minister said. Meanwhile, Non Cabinet Minister of Digital Infrastructure and Information Technology Ajith P. Perera denied Opposition’s allegation that the recruitment process of graduates to development officer service is politically influenced. He said that the selection process is transparent and said that these allegations are levelled against District Secretaries and Divisional Secretaries who are heading the selection process. Minister Ajith P.Perera also said that no special favourations is done for UNP supporters when selecting graduates to the development officer service. Opposition Leader Mahinda Rajapaksa yesterday called upon the government to recruit all unemployed graduates without depriving some of them on the basis of classifications in the manner the then government did in 2012 by recruiting 48,000 graduates in one instance. Opposition Leader Rajapaksa made this observation while making a special statement. He said 71 years have lapsed since Sri Lanka obtained independence from the British. “The free education system enjoyed by our children too is that old. It is so sad to observe that there is an unprecedented number of unemployed youth in the country with degrees certifying that they are intellectually qualified. They are over 57,000 in number and among them, are thousands of graduates who have obtained Class passes,” he pointed out. “The increasing number of unemployed graduates now has become another index. It is so tragic to notice that 60,000 unemployed graduates suffer under the rule of a political party which became the government by giving an attractive electoral promise that it would create one million new jobs for the youth. This government promised to give jobs to all unemployed graduates and even called around 50,000 for interviews for that purpose. But actually, jobs were provided to only 5,100 graduates as shown by government statistics,” the Opposition Leader said.